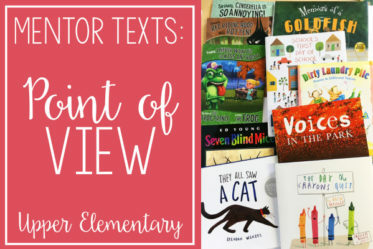 When I sat down to compile my favorite read alouds for teaching story elements, my list just grew and grew. 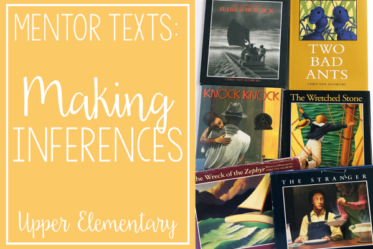 There are so many great story element mentor texts that it was even difficult to narrow down to this list. 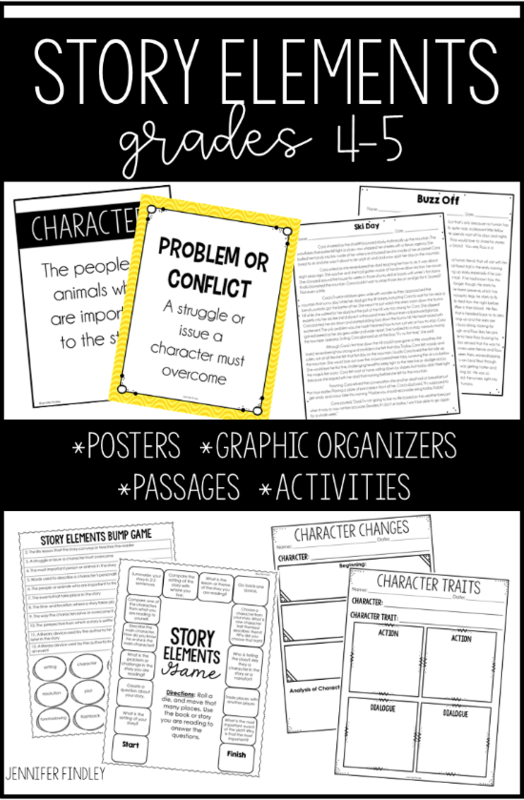 However, I wanted to include a lot of choices to cover the depth of story elements required in 4th and 5th grade. In an effort to keep the post short, I am only including a very brief summary of each story. For more information about the story, check out the Amazon listing by clicking the title. 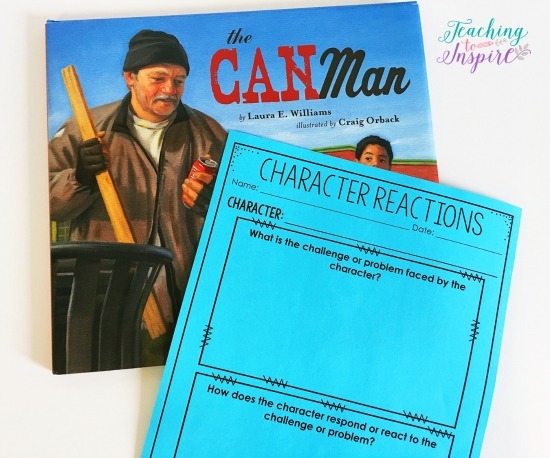 Before we dive into the read alouds, you will notice that in each image, the read aloud is paired with a suggested graphic organizer. 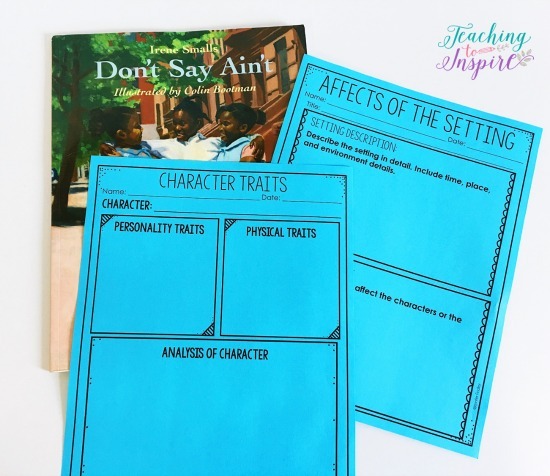 The graphic organizers are optional but really help focus the lesson and help the students organize their thoughts. 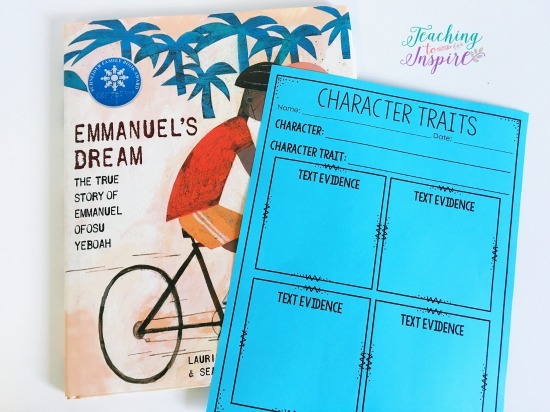 The graphic organizers are available for purchase in my Story Elements unit which you can see by clicking here. Brief Summary: A cold-hearted man is gifted with magic figs which make his dreams come true, but the real drama happens when his dog eats one of the figs. Click here to see The Sweetest Fig on Amazon. Brief Summary: Based on a true story, this read aloud tells the story of a young Emmanuel, born with a deformed leg who would later become a hero for his country. Click here to see Emmanuel’s Dream on Amazon. Brief Summary: A young girl and her grandmother bake a cake to ease the girl’s mind about the approaching storm. Click here to see Thunder Cake on Amazon. Brief Summary: When a new neighbor boy moves in, he becomes the main character’s number one enemy, but all that changes when his dad comes up with a plan to make an enemy pie. 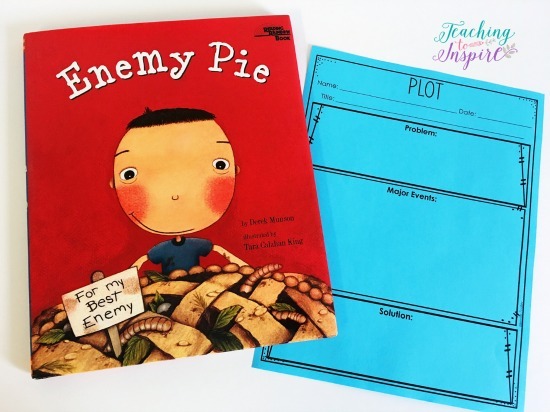 Click here to see Enemy Pie on Amazon. Brief Summary: Set in the 1950s, the main character struggles to fit in at her new school while remaining close with her childhood friends. Click here to see Don’t Say Ain’t on Amazon. 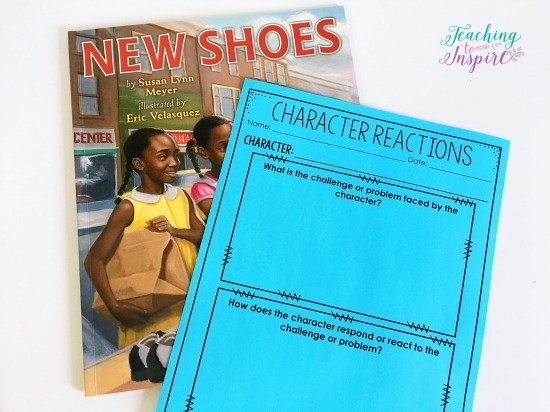 Brief Summary: Set in the South during segregation, a young girl and her friend make a plan after they are not allowed to try on shoes in a store because of the color of their skin. Click here to see New Shoes on Amazon. Brief Summary: Born a slave, Henry must do the unthinkable- mail himself to freedom in a box, after his wife and children are sold. 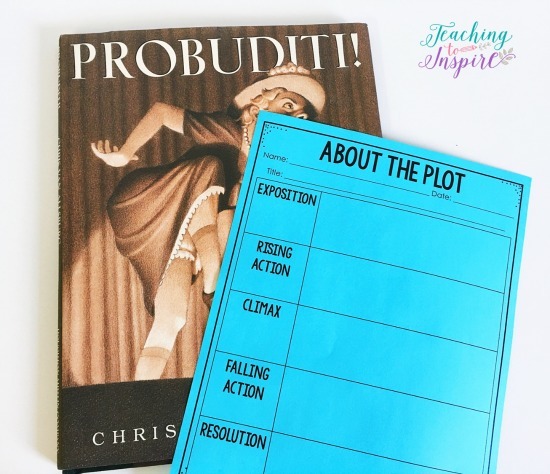 Clear plot structure with exposition, rising action, climax, falling action, and resolution. Click here to see Freedom Song on Amazon. Brief Summary: After attending a magic show, a young boy hypnotizes his sister into thinking she is a dog and must return her back to normal. Click here to see Probuditi on Amazon. Brief Summary: A young boy earns money for his birthday by collecting cans, and leaving little to no cans for the local homeless man who collects cans as a means of earning money. Click here to see The Can Man on Amazon. Brief Summary: Unhappy with their living conditions, a man and his dog are sent to paradise, but soon find out that it is not all they thought it would be. Click here to see Hey, Al on Amazon. Brief Summary: A young yellow snake doesn’t want to grow up to be a big, green snake, who are everything he doesn’t want to be. 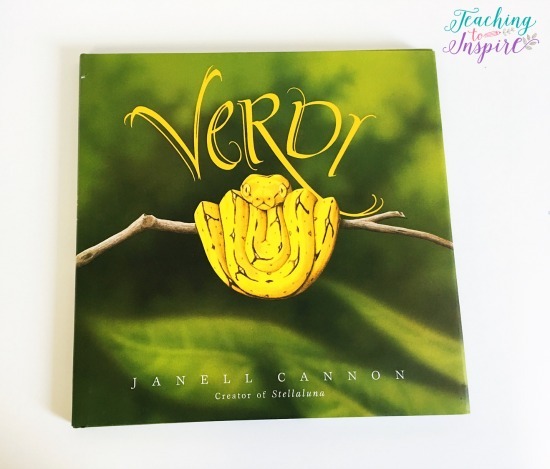 Click here to see Verdi on Amazon. Brief Summary: A young girl goes back and forth between two very different “worlds” as she visits her European-American grandparents one day and then her Mexican-American abuelitos (grandparents) the next day. 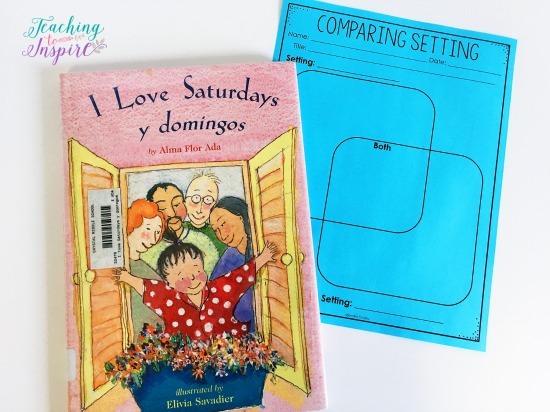 Click here to see I Love Saturdays y Domingos on Amazon. Click on each title above to see the book on Amazon. 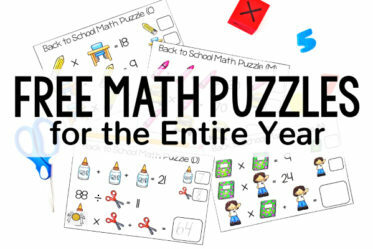 Check with your media specialist to see if the books are available and to see if she has money in the budget to buy books specific for teaching the standards. Check with your local library about availability. 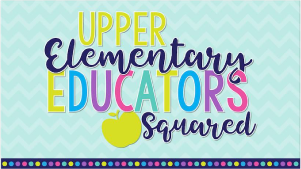 Go in with your grade level and purchase a handful of the books to share. 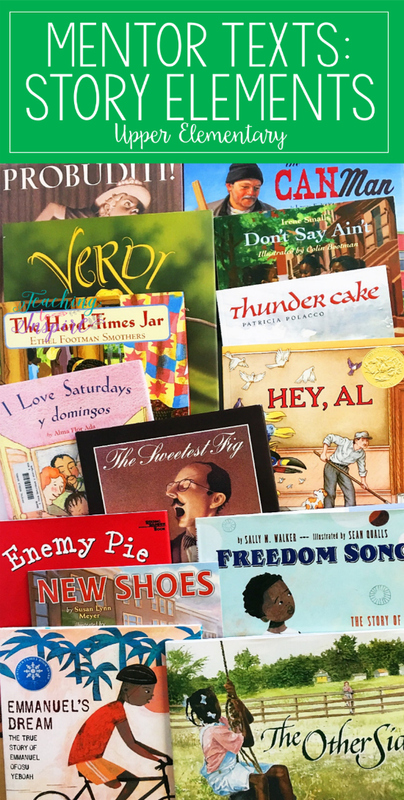 Hold a fundraiser for the specific purpose of purchasing new read alouds. 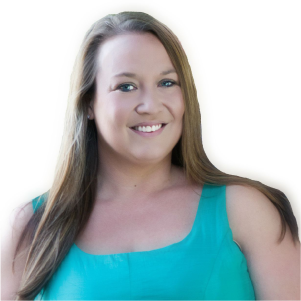 Check out fundraising ideas by clicking here. Click here to grab a downloadable copy of this list to help you when you are searching for the books at libraries. 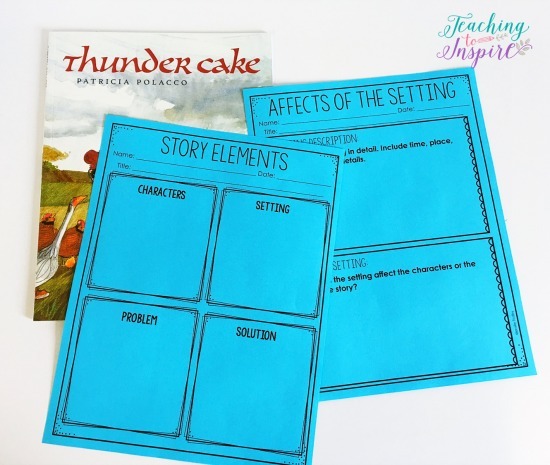 As mentioned previously, I like pairing graphic organizers with read alouds when I teach story elements. 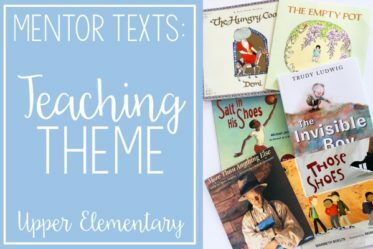 Not only are graphic organizers an excellent way to help focus a read aloud lesson, they can also be placed in a reading center with the picture book for the students to complete. 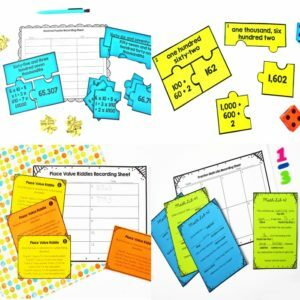 To purchase all of the graphic organizers shown in this post, click here or on the image below. 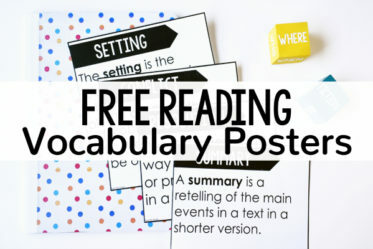 These are a part of a huge resource pack that specifically focuses on story elements and also includes posters, passages, and other activities for teaching story elements. 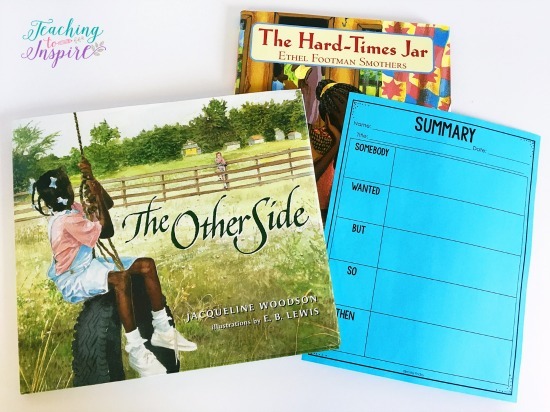 After practicing identifying, describing, and comparing story elements with read alouds, we move into doing this with passages that the students read independently or with partners. I use the passages in my Story Elements pack referenced above. 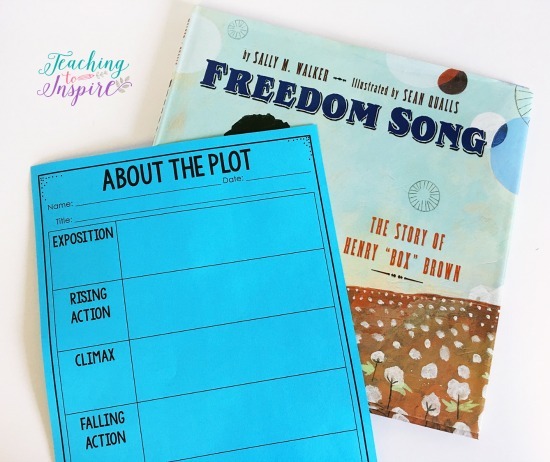 After the students have mastered the skills, they are then spiral reviewed through guided reading groups, other read alouds, and students’ reading response journals. 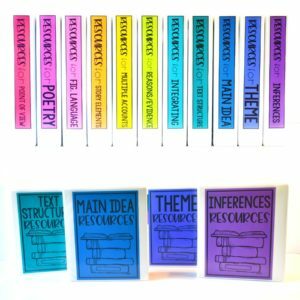 For me, the ultimate goal of any set of lessons is that the students can generalize and transfer that skill knowledge to their own independent reading. 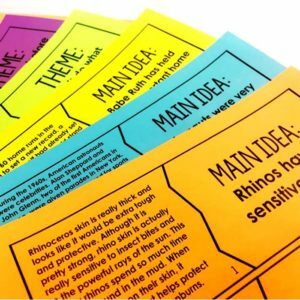 By having the students (once a week to every other week) write responses to their reading (through reader’s response letters, graphic organizers, book talks, etc), the students will be regularly revisiting this skill in a more authentic way, which will help them master it with any text they read in the future. 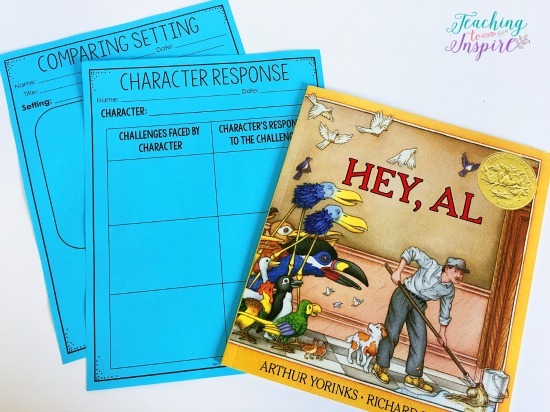 Do you have any other recommended read alouds to teach story elements? Tell us the name and specific skill in the comments! Hi Bre, it depends on the skill and how much more explicit practice is needed. 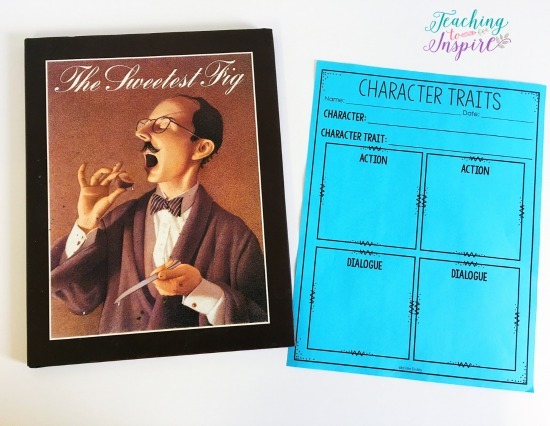 For example, when teaching character traits, we would do a read aloud, then the students would be asked to determine the character trait and provide evidence based on the book they are reading. Depending on how well they do this, we may practice with a passage. I may do 1-2 read alouds for basic story elements and then independent application/passage before moving on to the next set of skills. Never mind 🙂 my screen didn’t load that part of the blog. Thank you for this! Great list. I’d consider adopting these technique. I love your blog by the way. Thanks for sharing! 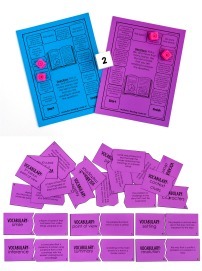 Can you give me an example of what your mini lesson looks like in a 5th grade classroom? 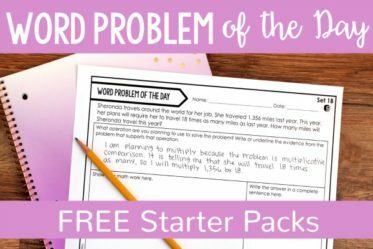 I just bought your 4-5 Story elements, and I am looking for a little help.